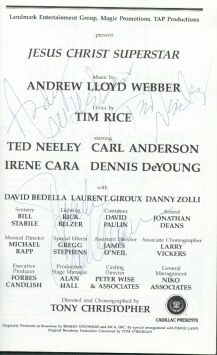 Over the years, I started to collect autographs from those people that have inspired me in some way. At one time, I had an interest in Canadian politics and studied Public Administration at the University of Windsor. 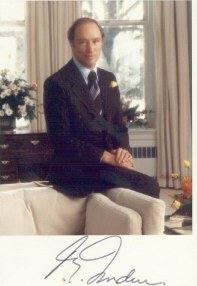 I started to collect the Prime Minister's autographs in Public School (with Pierre Trudeau) and have continued to do so to this day. 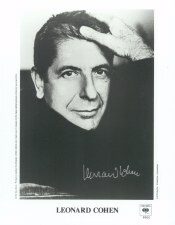 Later in life, I developed a passion for music and started to collect autographs from musicians. What follows are some of my favourite autographs. I included a little blurb at the end of each autograph to explain "why" they mean something to me. I received these autographs in many different ways. I actually met some of the personalities, some were given to me as gifts, some were purchased and some were received through the mail. I hope that you find this interesting! 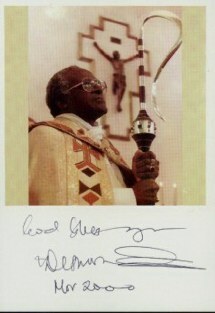 I received this autograph way back in 1982 when I did a school assignment in Grade Nine for Canadian History. I wrote Mr. Trudeau and asked him some very basic questions about Canadian Government and Politics. A few weeks later, I received a package from the Prime Minister with information about him (a biography) along with a letter from him wishing me luck with the assignment. 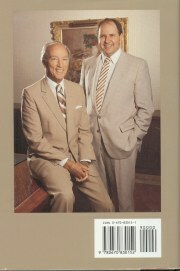 He provided me with alot of other information about Canadian politics and included an autographed photograph of himself. Some friends questioned it's authenticity, but the photographed is stamped on the back that it is authorized and authentic. 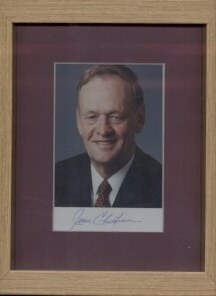 I met Jean Chretien in Windsor, Ontario when he was campaigning for leadership of the Liberal Party. After his speech, he mingled with the crowd and I managed to have a few words with him. He had a few drinks by then and was quite funny. I managed to take a campaign poster down off the wall and he signed it. He was a very pleasant man - especially when he had a few drinks in himself! 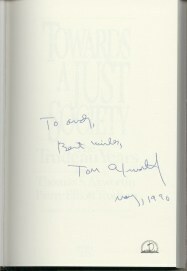 When I was reading "A Just Society" by Tom Axworthy in 1990, I had heard that he was giving a presentation at the University of Windsor. So, I grabbed my book and turned up hoping to meet him. 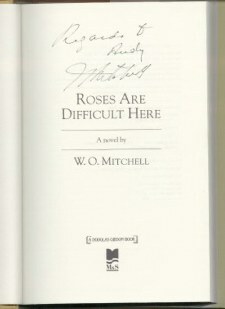 I met him afterwards and he was kind enough to sign my book. Axworthy was not only the Principal Secretary to Trudeau, but he also taught at the Center for International Affairs at Harvard University. "Building a Mystery", "Ice Cream", "Path of Thorns" and "Hold On" (which just happened to be my four favourite songs by her). I was able to meet with her afterwards (picture above) and she signed her CD cover for me. There is a long story behind this one and I won't bother getting into it here. Needless to say, I had wanted to seek his advice on an issue that I was struggling with. 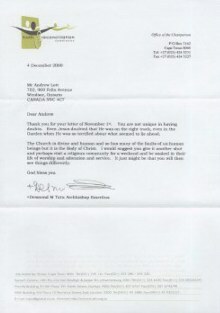 So, I had written to his "Commission of Truth and Reconciliation" in Cape Town, South Africa and he gave me a personal response. I had asked him for an autographed postcard (which is included on the left) and he sent me a signed letter from his Commission (on the right). 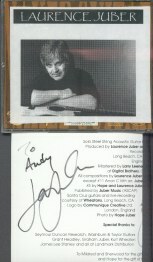 Laurence Juber was the lead guitarist for Paul McCartney & Wings on the "Back to the Egg" album (1979). He won a Grammy for his guitar work on "Rockestra Theme" (from the album). I met Laurence in Chicago a few years ago during a music exhibit. A student from my residence at University studied Drama and asked me if I'd like to go and see "Jesus Christ Superstar" at the Fox Theatre in Detroit, Michigan. I decided to go and she insisted on waiting at the back door after the show hoping to meet Neeley. I remember freezing my arse off that night and getting really annoyed when the back door opened and Irene Cara stepped out. She was in a bad mood, so none of us asked for an autograph and she jumped into a cab and left. Just then, the door opened again and an employee asked us what we would like. My friend wanted to met Mr. Neeley, so he invited us in. Before we knew it, we were back stage at the Fox Theatre meeting the entire staff of the production. Ted Neeley and Carl Anderson (from the original movie) were kind enough to sign my program and chat with us for about 10 minutes. Mr. Neeley then took us around and introduced us to the entire cast. It was quite the surprise.